We love making food from the ground and with very simple ingredients – this way we exactly know what the food consist off and that’s a feeling we like. This recipe for almond butter is a great example for some food that’s super easy to make and only made from one ingredient, almonds! Almond butter can both be raw or roasted which indicates whether the almonds are raw or have been roasted prior to grinding. 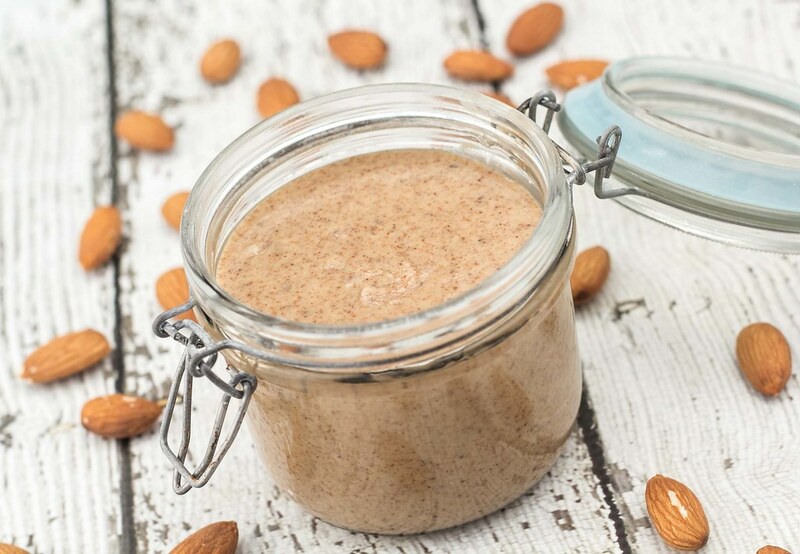 As said, almond butter are very easy to make; you simply roast some almonds on a frying pan and then blend them in a food processor for about 5-10 minutes. This way you extract all the great oil from the almonds and turn them into a smooth and delicious butter, which is ready to be smeared on some bread – it’s just wonderful. Almonds are known to be a great source of vitamin E, dietary fibers and essential minerals like magnesium, copper and calcium. Step 1: If you want a roasted almond butter, start by roast the almond on a hot frying pan for a couple of minutes or until they start to change color. Step 2: Pour all the almonds in a food processor and blend them. At first the almonds get chopped, then they become flour-like, then the flour start to thicken and finally the almonds are turned into a smooth almond butter. Keep blending until the butter has a creamy and butter-like consistency. It takes about 10 minutes of blending. If your food processor starts to heat up, let it cool for some time and then continue. Step 3: Clean a glass jar using boiling water. This will kill all bacteria and extend the shelf life of the butter. Pour the almond butter in the jar and keep it refrigerated.